Historical Biographies, Nova Scotia: Samuel Vetch (1668-1732). Sam got himself involved in the family's business and soon found that the most profitable trading was to be had by dealing with the French at Quebec -- never mind that this constituted trading with the enemy. Returning to Boston in April of 1709, Vetch laid his plan before the colonial leaders. A great force was going to capture Quebec and by so doing cut the heart out of New France. Times passed and all waited for the promised ships, troops, guns and supplies. Weeks went by, and then months; the invasion planners were to be disappointed, for Britain, as it turned out, needed all her resources for the European theatre. Vetch went back to England to rescue the plan best he could. 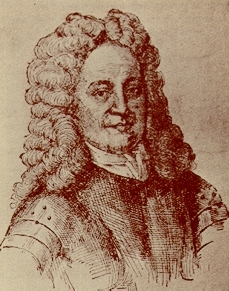 In the spring of 1710, he returned to New England with all the necessary authorities and resources necessary to mount an immediate attack on the French possession of Port Royal. This attack, as we may see from our narrative went well for the British, but Vetch still wanted to have a run at Quebec and continued to press the authorities for the necessary support so that he might do so. In the following year, a large British force under Admiral Walker and Brigadier-General John Hill -- Vetch was one of the commanders -- sailed up the St Lawrence, but returned without arriving before Quebec, as nine ships of the armada went up on rocks somewhere in the River; Walker who apparently had little stomach for the campaign used the lost of his ships as an excuse to retire without firing a shot -- a big disappointment for Vetch. We have scanned in an additional portrait of Vetch. For more complete particulars of Darien Scheme, its reasons for its failure and the involvement of the Vetch brothers: see NSHS, vol. 4, pp. 11-112; and more generally see Trevelyan's England Under Queen Anne , vol. 2, chapts. 12 &13. Margaret's brother, John, incidentally, was an accomplished Indian fighter; he was with Vetch in 1710 at the siege of Port Royal. DCB ; and see Steele's Politics of Colonial Policy ... , p. 116, where we see that Vetch presented his plans to the Board of Trade during August of 1708. A Half Century of Conflict (vol. 1), p. 134. I see that there is a work apparently devoted to Vetch, Samuel Vetch, Colonial Enterpriser (Chapel Hill, North Carolina, 1960) by G. M. Waller.